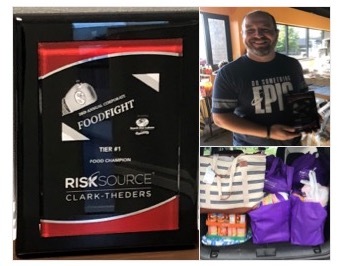 RiskSOURCE Clark-Theders was proud to participate in the annual Reach Out Lakota Corporate Food Fight. Reach Out Lakota is a non-profit organization focused on helping those in need living in West Chester/Liberty Township. Through their Food Pantry, they distribute over 18,000 pounds of food on average each month plus 4,000 pounds of dry goods such as personal care, paper goods, hygiene and infant care items. We are very happy to announce RiskSOURCE was the winner for highest monetary donation and highest in food collection! Thank you to everyone who helped from the RiskSOURCE team and the community at-large.